Oh, how hard we try to edit out of our experience all that we find to be unpleasant, unacceptable, or uncomfortable. We push those things into our shadow and try to pretend that they don’t exist. But those uncomfortable parts of our experience have much to teach us if we would but welcome them in and be ready to learn from what we find there. It is only by bringing our shadows into the light that they surrender their healing gifts. 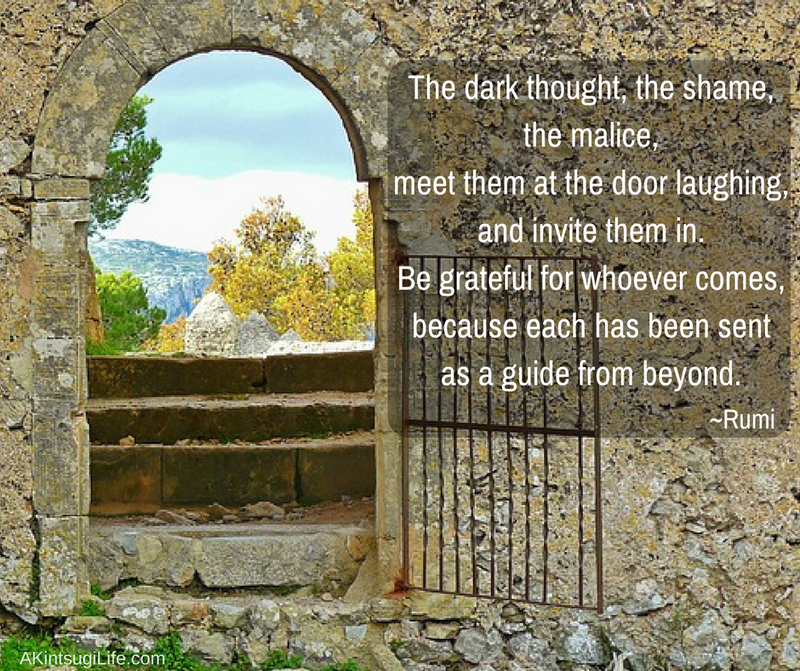 What parts of your experience need to be invited in, greeted with laughter, and allowed to guide you into growth and healing? How well do you listen to your inner guide? If you’ve been looking to others to guide your life and decisions and not getting the best results, it’s worth the time to learn how to attend to your own inner guide. It’s well worth the practice it takes in learning to listen! When you’re going through storms, it’s not easy to keep enough perspective to remember that the storm will pass. It feels like the storm is all there is. And yet, no matter how difficult things may be, it’s just the weather that’s passing through at this moment. 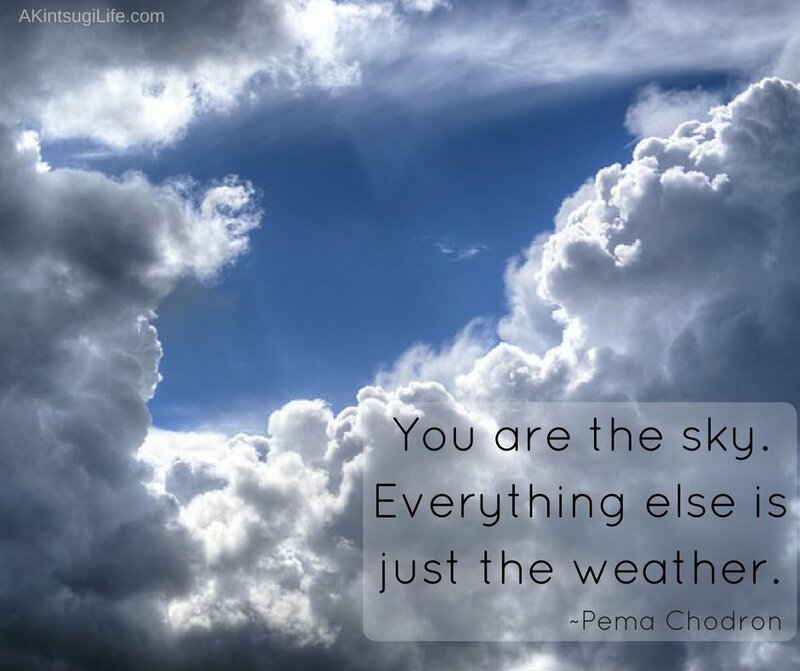 Coming back to remembering that we are the sky and not the current weather pattern broadens our perspective enough to make the hard times easier to bear. How does this shift in perspective make it easier to stay with whatever is happening in your life at this moment? Life has been good the last few months. Although I still have all of my usual challenges (plus a few sometimes), I continue to feel better and better about my life, about myself, and about the way things are going. I have more energy. I feel stronger (emotionally and mentally). Opportunities keep appearing and things keep falling into place at just the right time. As much as I am enjoying this shift, I keep noticing myself anxiously trying to pinpoint the reason behind this change. After all, if I know what is causing this improvement now, I’ll know how to hang onto it and/or repeat it in the future. But it hasn’t been all that easy to locate the magical key to this shift I’m experiencing. For one thing, there are so many small changes I’ve made to my self-talk, my habits, my attitude, and my self care. Any or all of these things could be the cause of this shift. It’s been a positive cycle for me where each small shift makes room for another shift which makes room for yet another shift in an ever-increasing spiral of growth. However, I did uncover one change I made that very well may be the foundation for all of the rest. I realized the other day that I started teaching yoga right after the start of the year, and that roughly coincides with the time when things started moving in a more positive direction. This may not sound like a big deal, but the discipline of teaching yoga has been the accountability I needed to re-engage in my own regular practice of yoga. As I’ve pondered the possibility that a regular practice of yoga could the foundation for this positive spiral I’m experiencing, I have gone back to think about times in the past when I have had a regular yoga practice and times when I have not. To the best of my recollection, every time period where I have maintained a regular yoga practice has been a much more positive period of my life. Those times when I have neglected a regular practice have not been nearly as positive or as stable. This is very interesting to me. You’d think that I would already have been aware of this connection since I am a yoga teacher. Clearly I see the benefits of yoga in my life or I wouldn’t have taken the time, money, and effort to become a certified teacher. And yet, the degree to which this is true in my life took me completely by surprise. In this case, at least, it’s clear that there have many other choices and changes that I have made that have contributed to my current positive state, but I am also convinced that yoga provided the foundation that made all of those other choices and changes possible. The practice of yoga does so much to reconnect me to my body and to bring me back into the present moment. Although I’m sure the extra physical activity from the asanas helps, it’s truly the power of being present to my body and its wisdom and being present in the here and now that is such a transformative practice for me. This awareness of the impact it’s had in my own life leaves me feeling ever more grateful that I have the opportunity and the honor to share this practice with others in my classes. I hear so many people say that yoga is not for them because they are not flexible enough (or strong enough or thin enough or whatever their excuse is), but it’s the awareness yoga brings that matters. Find a style of yoga or a teacher that resonates with you and give it try. You just might be as surprised as I am at what happens! In Western culture, we tend to not only view the mind, the body, and the spirit as separate parts of our being, but we also tend to place the highest value on the mind. I think this is slowly beginning to shift, but the priority we place on the value of our minds is something that is still an often unconscious assumption that underlies our choices, our behavior, and where we place our attention. Our body is often seen as just a housing for our minds. Likewise, western religion has shown a tendency to see the body as just the vessel that holds our spirit, with the spirit being given the greater value than the lowly vessel. While most of us do acknowledge the obvious effects our bodies can have on our minds—like the fact that we may have a harder time concentrating when we are tired or have a harder time controlling our emotional responses when stressed—research continues to show us that these interconnections are more pervasive and more subtle than we often assume. I read a fascinating post today in Scientific American online called A Brief Guide to Embodied Cognition: Why You Are Not Your Brain by Samuel McNerney that shares some history of the field of embodied cognition as well as some of the latest research findings. The entire article is absolutely fascinating! What they are finding is that our thoughts are much more strongly influenced by our physical experiences than we have previously realized. Many of the metaphorical expressions we use every day are indicators of this connection. For example, one study found that in a brief interaction with a stranger, a study participant who was holding warm cups of coffee was more likely to find the stranger trustworthy than a study participant holding cold cups of coffee. This impact of warmth on our perception of another person fits well with our expression of “warming up” to someone as we get to know them and develop a positive perception of them. This influence also works the other way. Another study showed that study participants who had just spent time remembering a situation in which they were socially accepted judged the temperature of the room to be about five degrees warmer than study participants who had just spent time remembering a situation in which they were snubbed. These sorts of unconscious interplays between mind, body, and spirit are occurring every moment of every day of our lives. When we attempt to place our priority and our focus only on our “rational” minds, we lose sight of the fact that the mind is interconnected with our bodies and our spirits in a way that cannot be cleanly divided into separate areas. For me, yoga has been one powerful way for me to become more aware of my full state of being. The development of a witness, or observer, consciousness through asana practice and meditation has allowed me to live with greater awareness of my body, my spirit, and my mind in any given moment so I can evaluate my thoughts and feelings with a more complete data set. It brings a greater mindfulness to all that I do. In one of my coaching classes last night, we discussed how often we react to situations based on past experiences that have pre-conditioned us rather than responding in the present moment to the situation that is actually at hand. The most powerful way to break these pre-conditioned reactions (or what yoga calls samskara) is to take a moment to become aware of the information that our emotions and our body itself is giving us before we respond. Not only has taking that time to notice helped me begin to change long-standing habits and make better decisions, it’s also helping me place a higher value on taking care of my body. I still have LOTS of room to grow in this area, but I am finding myself paying more attention to how much I sleep, what I eat, how much water I drink, my physical posture, and how much activity I am getting. I’m starting to make better decisions about my self-care, and I am learning to take the state of my body into account when I consider the messages my thoughts and feelings are telling me. It has truly broadened and enhanced my world. How do you make these connections between your mind, your body, and your spirit? 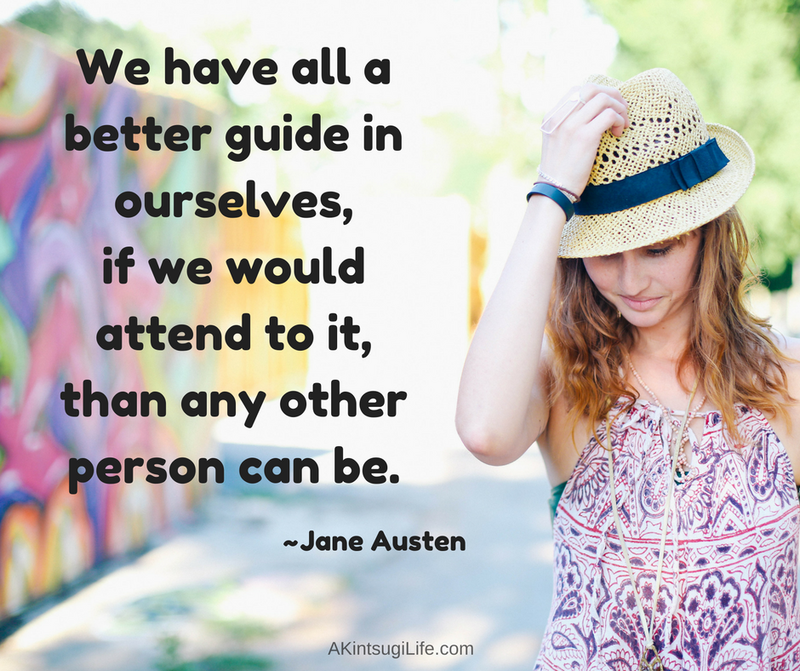 Do you give an equal priority to all of who you are? If not, can you think of one thing you can do today to start bringing better balance?